For those who have never used a machine before, or have not done so for a long time – come and learn the basics to give you the confidence to get going. You will learn to wind your bobbin, thread your machine, and then use your machine to make a simple tote bag or bunting. All materials are included in the cost of the workshop. 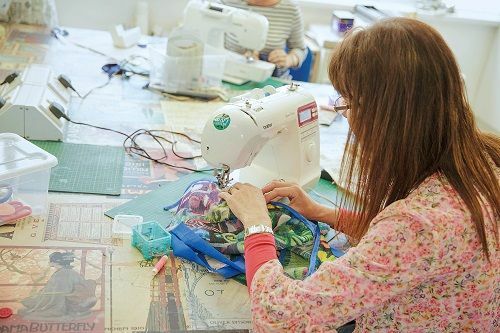 We have eight lovely modern Brother sewing machines for you to learn on, but if you have a sewing machine at home that you wish to get to grips with, please bring it with you for this class and we will show you how get started. Please also bring the instruction manual as each machine is different and understanding how to use your instruction manual really helps when you are sewing solo! Thinking of buying a sewing machine? We have a range of Brother Sewing Machines in store for you to try. Click here to find out more.